Home > Special Articles > Residential Property Remains Most Favoured Asset Class for Investors in India..! Residential Property Remains Most Favoured Asset Class for Investors in India..! In 1H2017, residential projects (including townships) across India attracted 56% of the total investment, i.e. more than INR 9,000cr out of the total 16,008cr. Commercial projects (including IT) got 22% or INR 3,500cr, followed by warehousing at 20% of the total. Retail could attract only 4% of the total amount due to the lack of quality mall supply. These investment figures are a combination of debt and equity. While the office asset class saw lower investment in 1H2017 compared to 1H2016 due to a lower number of equity deals, there are big-ticket deals in the pipeline that are expected to fructify in 2H2017. Residential, on the other hand, has cornered more than half of the total investments in 1H2017 thanks to the growing confidence in this asset class as RERA and GST get implemented and demonetization as well as the Benami Property Act promise to make residential real estate a far more transparent than it was ever before. Warehousing that has started seeing big-ticket investments saw the biggest investment deal so far in the country’s logistics space, brokered by JLL. As part of the USD 500 mn pact, the Canada Pension Plan Investment Board (CPPIB) acquired a majority stake in IndoSpace, the warehousing and logistics real estate arm of Everstone Group. As part of this deal, CPPIB will acquire 13 industrial and logistics parks totalling 14 mn sft. IndoSpace and CPPIB have also agreed to create a joint venture called IndoSpaceCore that will focus on acquiring and developing logistics facilities in India. While CPPIB has invested over USD 3.07 bn from 2015 – mostly into real estate and infrastructure, Everstone is the largest India-focused private equity investor with over USD 3.3 billion of assets under management. It is pertinent to note here that even though CPPIB may be the biggest deal so far, investors from other nations, especially Asian ones like China, Japan, Korea, have shown a lot of interest in developing industrial projects. 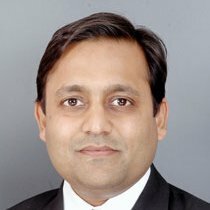 Mr. Shobhit Agarwal, MD – Capital Markets and International Director, JLL India.